Rats are being used in Cambodia to detect explosives, and they're really really good at it. The government estimates that there are four to six million land mines or other explosives - bombs, shells, and grenades - that litter the countrysides as the devastating byproduct of years of conflict. The rats, which are African giant pouched rats, are about two feet long from head to tail and they have horrible eyesight. But their sense of smell allows them to detect TNT in amounts starting at 29 grams. It costs about $6,500 to train each rat, which live six to eight years in captivity. "They are very good," Cambodian rat supervisor Hulsok Heng says. "You see this 200 square meters? They clear in only 30 minutes or 35 minutes. If you compare that to a deminer, maybe two days or three days. The deminer will pick up all the fragmentation, the metal in the ground, but the rat picks up only the smell of TNT. Not fragmentation or metal or a nail or a piece of crap in the ground." 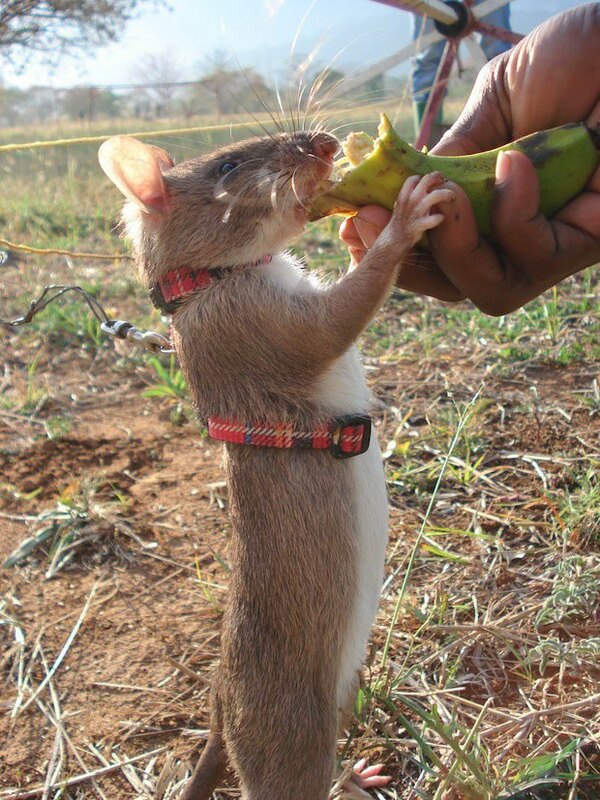 This species of rat comes from Sub-Saharan Africa. They are the largest muroids (rodent family) in the world. Unlike domestic rats, these rats have cheek pouches like hamsters, making them pretty darn cute.